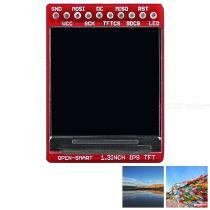 This is a 1.3 inch IPS TFT LCD expansion board with serial SPI interface. This display has a controller built into it with RAM buffering, so that it is easy to control by MCU. It leads out the pins of the TFT and breakout pins pitch is 2.54mm, so the secondary development is easy. It leads out PAD pins so that you can plug it onto the breadboard or use dupont cable to connect it for Arduino board. Use with RTC module, you can design your clock. Use with NFC reader module, you can create access control systems with the photos show. The breakout has the TFT display soldered on (it uses a delicate flex-circuit connector) as well as a ultra-low-dropout 3.3V regulator and a 3/5V level shifter so you can use it with 3.3V or 5V power and logic. We also had a little space so we placed a microSD card holder so you can easily load full color bitmaps from a FAT16/FAT32 formatted microSD card. – Can use it to display characters, graphics and BMP format images. – Compatibility: Because the logic level is 3.3V 5V compatible, it is compatible for Arduino board(Arduino UNO R3 / Arduino Nano / Arduino Mega2560 / Arduino Leonardo) or other 3.3V MCU. – IO Port Package: PAD is available, and the pin pitch is 2.54mm. – 4 wire SPI digital interface – SCK, MOSI, CS and DC pins. – Built-in microSD slot – uses 2 more digital lines. – Built-in auto reset IC that it will reset when power up, so you do not need to connect the RST pin usually. – LED pin is pulled up to VCC so you can keep it all day on if you do not use it. Transistor connected so you can PWM dim the backlight.